Well, that national day of mourning is upon us once again; Super Bowl Sunday. I can say that for a number of reasons, nine to be exact. You see, Donna and I come from a long history of teams that lost a super bowl. She grew up a Buffalo Bills fan and I grew up a Minnesota Vikings fan. Between us we have a combined 8 Super Bowl losses in our family. Throw in the 1997 Packer loss to the Denver Broncos, and well, that makes nine. Nine sad days. Nine letdowns. And this is nothing to say of the lost opportunities with NFC Championship chokes that the three teams have managed. That would add another nine. (There seems to be a trend here.) With perhaps the biggest NFC collapse in history happening two weeks ago at the hands of the Seahawks, well, just suffice it to say I will be watching tonight's game with great ambivalence and a bitterness that will take a while to go away. The debacle in Seattle deserves no more mention except to say that it eclipsed Gary Anderson's missed field goal a the end of the 1999 NFC Championship game. That one still stings too. Oh, and Brett Favre's throwing interceptions to the Giants and Saints. When I think back to my first Super Bowl, I remember watching the Colts and Cowboys in a thriller from my living room on Portland Avenue. I watched with my Mom and stepfather. It was a nail biter and kind of sucked me into the whole football experience. Well a few years later, I got to watch the team I idolized play in the Super Bowl. It was the Vikings and Miami at Rice Stadium in Houston, Texas. Below are memories of an impact player from each of the Super Bowls I have had a vested interest in. Super Bowl IV - Chiefs/Vikes - This happened before I was a fan, so can't tell you what happened except that Len Dawson schooled our secondary. 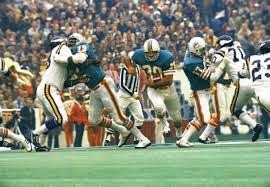 Super Bowl VIII - Dolphins/Vikes - I met a man named Larry Czonka on this day and watched him run over, around and through the Purple People Eaters. Still one of the most dominating running games I can recall. Mercury Morris played a good part too. 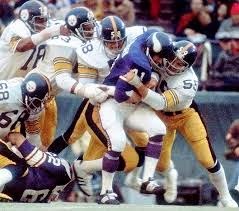 Super Bowl IX - Vikes/Steelers - I got a good taste of the Steel Curtain on this day. And though the game was only a 10 point affair, I don't think it was as close as the score indicates. Super Bowl XI - Vikes/Raiders - Ken Stabler and Fred Biletnikoff. Somebody catch that guy! 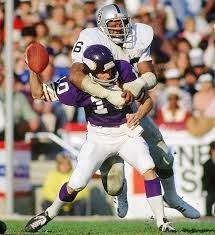 This was the end of a frustrating run of Super Bowls by my boyhood heroes. I'm still waiting for the day. Super Bowls XXV through XXVIII - Buffalo vs. Redskins/Giants/Dallas(Twice). The Bills had an electric no-huddle offense that I thought couldn't be stopped. Well, other than a Scott Norwood missed opportunity, the other three games were blowouts. I was beginning to think it was me and that whoever I rooted for lost. Super Bowl XXXI - Packers/Patriots - One of the greatest games I've ever watched. Reggie White took over this game when he needed to. Desmond Howard, Andre Rison, Brett Favre and the rest. FINALLY! It was a great day. Super Bowl XXXII - Packers/Broncos - I remember listening to the local radio on that day and fans were calling in predicting scores like 35 - 10 and such. I was thinking "Oh, don't say that. Have you been watching these broncos?" Well, Terrell Davis and John Elway showed us who was a little too cocky. Some horrible coaching at the end too. Super Bowl XLV - Packers/Steelers - This game is still like a "bonus" to me. We were never picked to be there, maybe shouldn't have been there, but showed everyone that we should never be counted out. I still have visions of BJ Raji's end zone belly dance after his touchdown versus Chicago that got us there. Then, to go on and beat a team I've grown to hate (the Steelers) well, that was all the more sweet. So, that's the rundown. As I look at it my Super Bowl record is 2-9, so that's nothing to boast about. More often a day of regret than one of celebration. I'll keep watching though. Now, I think I'll go sit down and root for Seattle mostly because I'm a Russell Wilson/Darrell Bevell fan. And if they lose, well, I'm totally okay with that too.